Attracting thousands of visitors each year, the Orange River makes for great river rafting, camping or fishing. The Orange River is also responsible for the flourishing vineyards along its banks, making towns like Upington, Kakamas, Keimoes and Augrabies in the Northern Cape not only productive, but also beautiful! Being born and raised in Kakamas myself, it’s hard to see the amount of devastation being caused by the one thing making survival possible in the first place in that area. People’s houses are flooded and destroyed; vineyards are under water making harvesting impossible for farmers. Eleven people were rescued from an island in the lower Orange River near Keimoes, while a number of families were evacuated near Upington as the river reached flood levels. Good rains in South Africa the last couple of weeks contributed to the current flood on hand. Rains in especially the catchment areas of the Bloemhof and Vaal Dam’s have resulted in sluice gates being opened. Now downstream, the river has become a raging, powerful monster. The Augrabies Falls alone attracts thousands of visitors each year during the year, but with the Orange River in flood, the falls is simply spectacular! 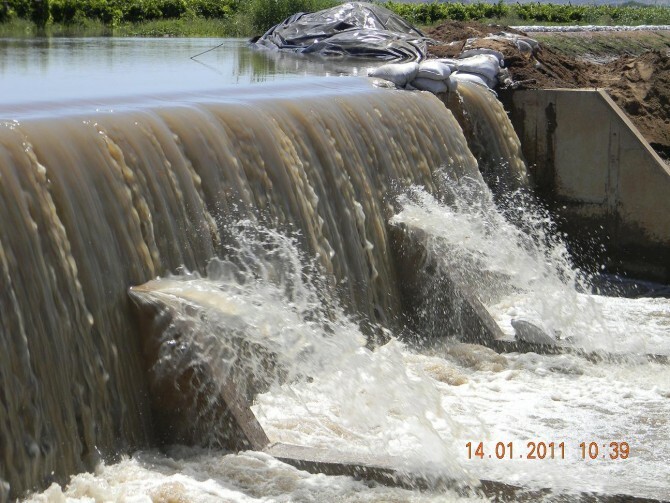 In February 2010, the Orange River was also very full with a flow of approximately 3 000 cumecs per second. The last big flood was in 1988, when the river flow was estimated at 8 300 cumecs per second! The flow of the river during the current flood is estimated at about 5 000 cumecs per second. Emergency walls were built, to protect the vineyards of so many farmers who still need to harvest. After working days and nights through to strengthen the walls, the river just became too full and too strong. The walls were let down, so that the river can overflow on its own. If the walls broke, there would have been more damage to the vineyards. But even though the Orange River, which most of us has come to love, is reaching havoc, we know that everything will be alright. I know that, because the communities stand together through this tough time, and it’s good to know that in times of need you can count on each other and you help one another. To me, the Orange River is like a sleeping dog. It’s your best friend, it can save you, but it can also devastate you. It just wishes to let us know that it’s still there, and it’s not to be taken for granted.